It’s difficult to overstate how our growing understanding of the trillions of microbes that live on and in the human body is radically changing the way we think about health and the prevention and treatment of a myriad of diseases. Not since Darwin unleashed onto the world the concept of Natural Selection, have humans been forced to rethink our place in the natural world and indeed the very definition of Self. Since the microbial cells we carry out number our own cells 10 to 1, we are more microbe than mammal and thus reliant upon this dynamic and diverse ecosystem within for proper functioning. Yet, despite the microbial connection in human health and well-being, not a single scientist with a background in human-microbe interactions is among the 15 panel experts recently selected by the U.S. Department of Agriculture (USDA) and the Department of Health & Human Services (HHS) to update the 2010 Dietary Guidelines for Americans for 2015 with the latest scientific and medical data. That means, as with the seven previous iterations of the Dietary Guidelines (revisions take place every five years), we will get another set of recommendations that only focus on 10% of the human body, ignoring the other (microbial) 90%. Not to take anything away from the 15 distinguished researchers who have “expertise in dietary intake, human metabolism, behavioral change, and health,” but the complete absence of what should be a handful of microbiologists and microbial ecologists on the expert panel guarantees the 2015 Dietary Guidelines for Americans will be outdated even before they arrive. Plummeting costs in DNA-sequencing and advances in analytics (bioinformatics) in the last 5 years has ignited a (micro) revolution in medicine and health, that literally advances by the month as waves of new research is published. While scientists throughout the world conducting this research are fond of saying these are early days – not wanting to over promise the implications of the science – the connection between our gut microbes and metabolic diseases such as type 2 diabetes and obesity, as well as inflammatory bowel diseases, cardiovascular disease, autoimmune diseases, non-alcoholic fatty liver disease, some cancers, and a growing list of other ailments of the modern world is compelling. At the core of human-microbe research is the notion that diet and lifestyle can have a dramatic impact on the composition and functional characteristics of your gut microbes. In other words, the opportunity to nudge your gut microbiota in a more healthy or optimal direction with diet and lifestyle choices that may lead to a more, lean or less inflamed you, is within our grasp (but yes, these are early days). This should be of great interest to the USDA and HHS as they seek strategies to improve the health of the nation. Perhaps more importantly, human-microbe research teaches us that our human DNA is not our destiny, and that achieving the maximum number of healthy years is grounded more in an enhanced understanding of human-microbial ecology rather than the tired notion that energy balance sits at the root of what ails us. If a microbial-centric and ecological view of human health were embedded or at least considered by the USDA and HHS, this would dramatically change the tone of the dietary guidelines and make them more relevant in our daily lives. For example, the guidelines are currently designed for persons more than two years of age. This is a striking cut off age when you consider that birthing method, breast feeding, early childhood nutrition in general, and early immune system education are critical to a healthy adult and firmly rooted in human-microbe ecology. It’s short sighted and archaic not to appreciate how much of the die is cast in the first two years of life (and in utero for that matter). 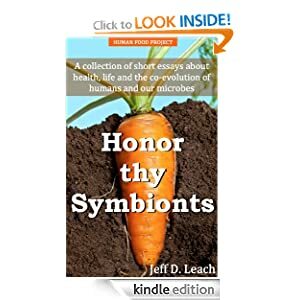 Dietary guidelines that ignore this critical symbiotic period with our microbes – as they currently do – miss the very essence of what humans really are, super organisms of microbial and mammalian cells (and genes). A handful of microbial researchers on the expert panel for the upcoming 2015 Dietary Guidelines would likely result in more attention to how simple, and often-mundane daily choices in how we live can dramatically impact the health of our gut microbiota and thus us. Perhaps opening a few windows in your home, or getting a dog, simple gardening, eating the more fibrous parts of our plant foods, swimming in microbial-rich ponds and lakes, or even thinking twice about taking yet another antibiotic for a run-of-the-mill sniffle – all of which may have profound effects (positive and negative) on the health of your gut microbes – would be considered as important or more so than your daily intake antioxidants or percentages of this nutrient over that nutrient or the eat less exercise more mantra. The upcoming 2015 Dietary Guidelines for Americans have an opportunity to matter. However, if the guidelines continue to ignore the basic biological fact that we are super-organisms, and that discordance with the microbial world may sit at the center of a lot that ails us, then the 2015 guidelines will provide us with very little. The expert panel has almost a year and half to deliberate before providing an advisory report to the secretaries of the USDA and HHS. To produce a report that is consistent with the current state of the science – and one that might have a chance of truly making a difference – we might need to break a few plates, starting with MyPlate. BioPlate anyone? Totally agree. What do you suggest we do? Do you have a petition we could sign? A rally we can join? Might be a good idea. But not sure it would make difference. Might make more sense to create our own plate – bioPlate – with the input of the microbial community of global researchers. Hi Jeff, so is there a bioPlate available with suggestions for good nutrition? Thanks Cathy. I often think about the conditions of assisted living facilities, homes for the elderly etc. Unlike traditional societies, we are walling off our seniors from the microbial world. Closed windows, sterile environments, lack of plants and animals around our seniors, is likely contributing the decrease in gut microbial diversity – not a good thing. Just the opposite is seen among the elderly in traditional societies where gut microbial diversity extends and in fact increases throughout life. I think a good start for the new ‘plate’ would be for the experts to differentiate between fermentable fiber, non-fermentable fiber, and resistant starch. Unless one has very good access to fresh fruit and veggies every day, we often get stuck eating less than desirable plants for gut health. I keep a jar full of a homemade prebiotic mixture of raw potato starch, psyllium husk, and plantain flour. I add 2-4TBS of this to my daily food intake to help close the fiber gap. Just coming across this article; can you comment more about this prebiotic mixture and how you started doing this. Thanks! The lack of life in the foods we often eat seems to be a critical part of the equation. The lack of quality of the food is equally appalling. A few years ago I read a wide number of food pundits during the time of ‘Good Calories, Bad Calories’ inspired debate, from Atkins to Pritiken and raw foodies. They all agree on some things; all like some type of raw food, no junk, preservatives or refined sugar, and all love the kole family of vegies. Obviously your research is more sophisticated than this, but sometimes it helps to start with basics. I like that your food project doesn’t advocate the right food but ranges of food or prebiotics that help feed our bacteria and therefore ourselves. I’ve noticed if I am eating a nutrient rich food I will eat less than if eating from a nutritional desert- like a plain pasta. How do all the vaccines, especially the adjuvants in them which contain aluminum and mercury, effect a child”s microbiome? Has any research been done on this comparing the guts of vaccinated children with unvaccinated? I have read that 80% of our immune system is in the gut so is there a better way to go than vaccinating to deal with childhood diseases? Do these childhood diseases promote a healthier gut/immune system? Couple of years late replying but just read this today. HI Jeff, I envy you! You get to live with the Hadza and become human again, I would die for that chance. I noticed in one of your lectures/presentations, that the Hadza are touching each other a lot, and drink from water which contains various sources of poop. We are constantly told not to go into dirty water, especially lakes due to rats etc…. I get the message from you….get dirty and feed our ecosystems(gut). Looking forward to my book..’Rewild’ too! Thank you. I am just as appalled as you are that none of the researchers of some of the departments that are in charge of stating what foods I should be putting into my body are not considering the 90% of my body that is microbial. I am currently a nursing student and I just took a nutrition class in which they taught me about MyPlate and told me that I should be teaching my patients to focus on that type of nutrition stand point, rather than a microbial stand point. Also, for the NCLEX nursing boards exam there are questions about nutrition that specifically focus on the Dietary Guidelines for Americans. I am honestly concerned that I am taught to teach patients about nutrition based on the departments standards, but that will not be focusing on their whole body. I will try to implement some of the suggestions you explained on how to improve your gut microbes in my practice with patient education in order to hopefully cause an impactful result in my patients’ health. Hi Jeff, I follow a Mediterranean diet and make an effort to eat more fibre than I used to consume. I avoid all starchy carbs, and consume instead fibrous carbs, berries, Can I ask if you if I am doing the right thing, or should I add organic raw honeycomb? Many thanks. We are now coming up on the 2020 Guidelines. Is there any chance that the composition of the panel of advisors will include someone who is involved with this kind of research? Or any way that we (as citizens) can lobby for this?